Consumers aren’t searching for products and services from behind a desk anymore. They’re empowered by mobile devices to explore the web on-the-go. Any inquiry, no matter the subject, can be answered in an instant, at anytime, from anywhere. Because of that, we’ve become curious, content-consuming creatures, asking extremely specific questions and using precise search terms. For example, we might ask: What is the difference between a suit coat and blazer? Compare price and features of Rolex versus Omega. Find sushi restaurants near me. There are over 100 billion searches conducted on Google each month. There are more than 100 billion searches conducted on Google each month. Additionally, more than half of those come from smartphones and tablets. In other words, if you’re not building a mobile-centric search strategy (more on this later), you’re going to be left in the dust…or should I say desktop. In fact, a recent Think with Google report found that 76% of people who search on their smartphones for a product or service offered nearby visit a business within a day, and 28% of those searches result in a purchase. So how can marketers capitalize on these on-the-go searches? These moments are filled with people searching for ideas, insights, and product information. Google found that most smartphone users in an I-want-to-know moment are on a quest for general knowledge, food & grocery suggestions, and to get shopping questions answered. With that in mind, this is a good time to reinforce a positive image for your brand and all that it offers. Think you’re too small of a business to win big traffic? Think again. Google found that 65% of smartphone users agree that, when conducting a search on their smartphones, they look for the most relevant information regardless of the company providing the information. Capture I-want-to-know traffic by anticipating frequent questions about your industry. If your information is relevant, you’ll have a good chance of pulling in high-quality traffic. I-want-to-go-moments occur when people are searching for places in their vicinity such as coffee shops, pubs, or gas stations. I-want-to-go inquiries revolve around shopping, restaurants & bars, and directions. To earn web traffic for these searches, use contextual and location-based signals to showcase your venue, store, or restaurant. Businesses should be sure they have a Google My Business account linked up to a website that’s been optimized for their specific geographic location. When merging high-quality local SEO with pay-per-click/paid search, Google found that 10-18% of clicks on location-specific search ads lead to an in-store visit. Google also found that location-specific mobile searches are growing 50% faster than all mobile searches. Moreover, they noticed that 88% of all “near me” searches happen on a smartphone or tablet. Interestingly, “near me” searches have grown over a staggering 3,400% since 2011. These I-want-go-moments are particularly useful for new restaurants, stores, or service providers that haven’t established themselves yet. This is because during these kinds of searches, convenience is generally weighted heavier than brand loyalty. Have you noticed your family, friends, and coworkers becoming pseudo-professionals in household repairs, culinary arts, or web development? The internet has afforded the opportunity for consumers going through an I-want-to-do moment to find instruction manuals, recipe books, and “how to” videos for just about any task under the sun. To capture some of this search traffic, tap into the whopping 91% of smartphone users that turn to their mobile devices during a project. Written and video content are both critical for capturing I-want-to-do moments. Be sure to cite high-quality sources, use good details, and compose relevant titles for your blogs and vlogs. Incredibly, Google found that “how to” video traffic is growing at a stunning 70% each year. What’s more? A staggering 48% of smartphone users are more likely to buy from a company with instructional video content. Perhaps the Holy Grail of micro-moments is the I-want-to-buy moment. The most common searches during these times are about shopping, food/groceries, and restaurants/bars. Moreover, Google found that 79% of people took a relevant action on their smartphones prior to making a purchase. So, whether it’s at home, on-the-go, or in a store, these moments can take place anytime, anywhere...and we mean anywhere. In their True Wireless Confessions: How People Really Use Their Mobile Devices report, Verizon found that 90% of people use their phone on the throne. What's more, PayPal found that 50% of Millennials shop on the john. Businesses can capitalize on these moments by providing high-quality content and a “frictionless checkout.” These I-want-to-buy moments are also a great time for smaller companies to spread brand awareness. In fact, Google found that 51% of smartphone users have discovered a new business or product when conducting a search on their smartphones. Mobile devices have created extra savvy consumers. No matter the price of the item, search engine users are researching products and services thoroughly before making a purchase. 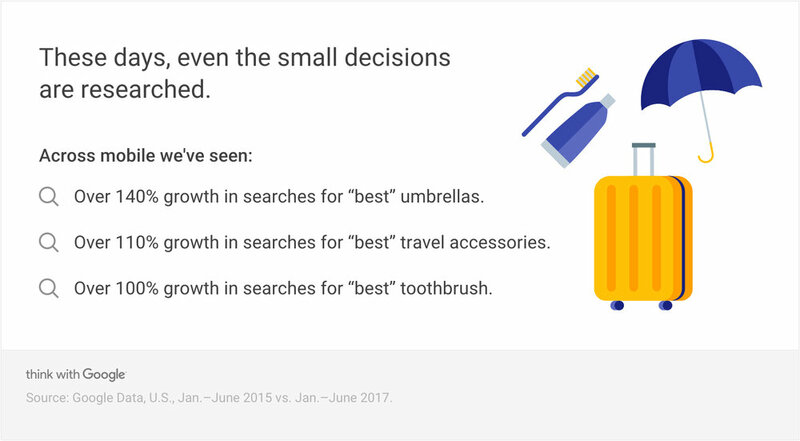 For instance, Google found that “product review” searches have grew 35% between 2015 and 2017. What’s more, 82% of smartphone users say they consult their phones on purchases they’re about to make when they’re already in the store. However, confusion can arise between I-want-to-know and I-want-to-buy moments. For example, Google found that luxury car price searches grew 90% on mobile devices between 2014 and 2015. But here is the problem: are those people listening to a song that mentions a Maybach and suddenly want to know the price? Or are they really looking to buy? To help differentiate your web traffic, it helps to learn Google Analytics or find a marketing agency that knows its way around search data. With the proper analysis, you’ll be able to understand the consumers’ “intent and context signals.” These indications help you determine why the potential customer is on your site and where he or she is located. Google found that 75% of smartphone owners turn to search first to address their immediate needs. But these potential customers are impatient and generally in a hurry. This means you need a website that is fast, very fast. In fact, Google’s 2017 report with Akamai reported that just a 100-millisecond delay in load time hurt conversion rates by up to 7%, and a two-second delay in load time hurt bounce rates by up to a crushing 103%. Want to know the impact of your slow loading time? Check out Google’s Impact Calculator and their Mobile Speed Test. Be Mobile Friendly: Regardless of your industry, you can capitalize on these moments with some simple content-driven steps. But first and foremost, be sure that your website is mobile friendly. Without that, you’ll miss the vast majority of micro-moments. Take a Walk In Your Customers’ Shoes: You have to anticipate the micro-moments that your products or services address. Ask yourself how you can be there for smartphone users. Should you catch a consumer in a micro-moment, be sure to provide useful content that answers their inquiry without any complicated navigation. Consider Paying Per Click: Consider using pay-per-click ads to use contextual ad messages such as location extensions, local inventory ads, prices, and reviews to attract more customers. With Google AdWords—especially with Analytics integration—you can accurately measure the impact of digital marketing both online and off. Search Your Console: Have your marketing agency set up Google’s Web Master Tools for your business to identify what devices your traffic is coming from and what search term(s) the consumer used to find you. From here, you can decide what kind of micro-moments are most important to you. Once you know that, you can begin producing relevant content that’s tailored to your potential customers’ search inquiries. Keep Up With Keywords: Be sure to use rich, detailed keywords in your titles, descriptions, and body content. Also, find synonyms for your products and services to ensure you cover all your bases. Conversely, don’t keyword stuff your pages, as Google will drop your rank if it notices a high rate of keyword density on your page. Create Written & Visual Content: To truly cover your bases, you want to put out content in multiple mediums including written work, pictures, and video. Think about producing shopping lists, study guides, infographics, and “how to” videos. The biggest hindrance to capitalizing on these micro-moments is time. How can you effectively manage your business and produce this much content? Well, most businesses can’t, nor should they want to. Reach out to Ethos Copywriting to learn about our content marketing and production packages. We’ll help you take advantage of the micro-moments that can help you increase traffic, generate leads, and boost online and offline conversions. Did you dig the blog? Please click the like button below, leave us a comment, or share this on social. Thank you for reading!